EasyBet is a live casino belonging to the TGI Entertainment. Holding a licence from the Curacao authorities, easyBet Casino offers quite a large range of games to compete with the many other online casinos already in the market. What are the characteristics of this new platform and what is it offering? This is what we want you to discover in this review. There is a lot of diversification within the ranges of games on offer and easyBet is no exception to this rule. To offer the most interesting possible range, the site uses expertise of several well known developers such as NetEnt, Betsoft, Microgaming, iSofBtet and 1x3Gaming and others including Pragmatic Play, Oryx Gaming and Gameart. The result is quite a full range of games that is well organised and has the usual main categories: slot machines, table games, video poker and others. Everyone can find something both in terms of the quality of the entertainment and payments ; several jackpots are available. Fans of live dealer games are well catered for in easyBet Casino. The platform has a whole section totally dedicated to this type of game whose main aim is to let you have an experience that is as close to reality as possible. To this end the site is using the services of three well known groups in this area: Ezugi, Evolution Gaming and NetEnt Live. Offering live tables from land based studios in different parts of the world, the developer Ezugi stands out for the diversity of its offer which includes roulette, baccarat and blackjack tables and also Keno and live lottery. There is no need to introduce the second on the list. A leader in this sector, Evolution Gaming offers its many interactive and immersive tables. We have also noticed the presence of an almost unknown new developer: Hollywood TV. Situated in Qorim, a small town in Malta, this developer offers the first Live TV Roulette tables in the industry. This should be worth tesing. This section is well stocked. It all begins with a welcome bonus of €100 up to €250 on your first deposit and from 150% up to €450 on your second deposit. So the total bonus is €700, which is a good offer for its launch. Wagering is 45 times the amount of the bonus and deposit before any withdrawal. You can play without any bonus so you can withdraw your winnings at any time. Then there are several regular offers such as a bonus of 120% up to €200 on deposits made on a Sunday, free spins given for bets on the slot machine of the week and also the casino sponsorship bonus which can take different forms including free spins for the sponsor and the person sponsored. Finally, there is a loyalty scheme that allows regulars to gain different prizes by building up points as they bet. EasyBet accapts several paymet methods. So players can make deposits using bank cards like Visa or Mastercard or Neteller, Skrill, Zimpler, Debit and InstaDebit. On the other hand, crypto money such as Bitcoin, Ethereum, Dogecoin,Bitcoin Cash and many others aren’t yet accessible in easyBet. 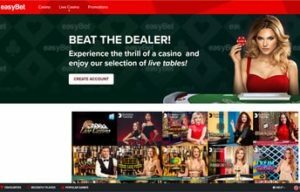 Although just recently launched, easyBet is already fast becoming an interesting destination for all online casino fans. We like its modern style as well as the diversity of its RNG offer. The developers chosen for its live section all have good gaming experience at this level. We are lacking some information on the site’s promotions and its customer service. But it’s only starting out and we can only welcome this new platform, which will surely surprise us.